Brand new from Fischer, the RC4 The Curv 130 builds on the success of Fischer’s popular RC4 series. This model features a new last shape, aramid inserts in the midfoot for improved lateral stability and a consistent flex, and an improved liner offering better warmth and precision over previous models. Features Fischer’s Vacuum Full Fit technology for maximum customisation. Bootfitter’s comments: Our boot fitters and customers love the convenience and infinite abjustability of Fischer’s Vacuum system, and we’re excited to get our hands on Fischer’s new flagship model. The Curv range retains all the adjustability of the old RC4, with a few improvements to address some performance and comfort niggles we had with the older model. This will be a great option for aggressive, technical skiers looking for a fully personalised fit! 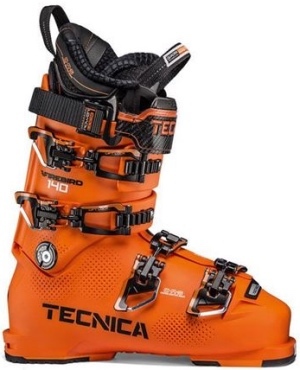 Packed with all the performance and adjustability of the flagship RC4 Curv 130, but in a more forgiving 110 flex, this is a serious boot for the lighter or less aggressive skier who doesn’t want to compromise on fit and precision. Bootfitter’s comments: The RC4 Curv 110 offers the Vacuum Fit experience to a broad range of skiers, from aspiring intermediates to advanced skiers who don’t need a race flex. Our boot fitters can mould the shell around the customer’s foot for unparalled precision. Built from the ground up, the all-new Dobermann GP 130 features a 98mm mono injected PU performance shell, an intuitive easy entry instep, an all-new HP custom cork liner, a Full Motion Pivot alignment system and a revolutionary new Power Driver design. 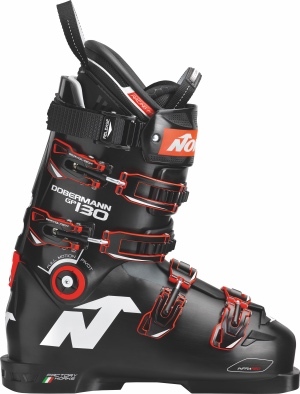 Nordica packed the best of it’s 75 years of boot building experience and a most modern technologies available into the Dobermann GP 130, to create a high performance experience you will never forget. Bootfitter’s comments: A serious performance boot packed with race-inspired features. The cork liner and shell construction offer awesome lateral stiffness and response. Maximum power, support and stability for quick turns. With the Firebird 140, speed freaks can literally fly down the mountain. The anatomic fit with asymmetrical toe box and numerous customizable options make this boot comfortable to wear, no matter how long you’re out chasing your best time. Bootfitter’s comments: The brand-new Firebird 140 offers ultimate responsiveness and power, thanks to the burly 140 flex and precise 98mm last. Tecnica’s CAS shell and liner allow a much more customizable fit than most race boots, allowing you to charge all day in comfort! The legend is reborn with all new models, all new fit and all new performance. Coreframe reinforcement, sense-amplifier cuff and Salomon's seamless liner team up with their mono-injected shell featuring Custom Shell HD for improved fit, improved snow feel and improved downhill performance. It is time for a new four buckle standard. It is time for S/Max. Bootfitter’s comments: Replacing the bestselling Xmax range of boots, the new Salomon S-Max line offer a hugely reduced weight and more anatomical last, while still retaining the power and precision that made the Xmax so popular. The innovative Coreframe construction keeps the midfoot and ankle precise and responsive, while the Custom Shell allows a personalised fit for optimum comfort all day long. The new Salomon X-Max 120 is a high performance boot for aggressive skiers who have a narrow shaft of the leg and narrow to medium forefoot. Salomon's new CoreFrame Technology has a thinner shell and internal reinforcement that reduces the weight, improves your sensitivity to the snow and adds energy transmission to your skis. The new Custom Shell HD uses a new mixture of the Kaprolene that when heated by an Authorized Salomon Dealer molds to your foot in a matter of minutes. The Seamless Pro Liner is also heat moldable for total customization for a comfortable and performance fit. Salomon's 24mm Oversized Pivot creates a burly connection between the upper cuff and lower shell that drives energy directly towards your skis. If you want a powerful boot that rips at high speeds, the Salomon X-Max 120 is a perfect choice. 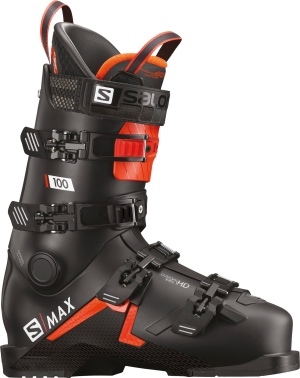 Bootfitter’s comments: An exciting new option for strong, aggressive skiers, the SMax 120 is a lightweight, precise boot with enough power and precision to charge the whole mountain! The 120 flex gives a bit more versatility and forgiveness than the 130, while still packing plenty of performance. 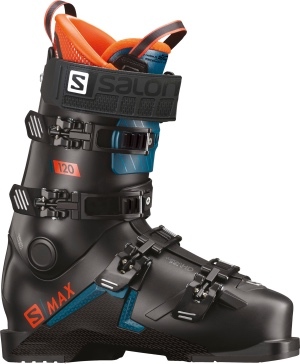 Bootfitter’s comments: A new lightweight alpine boot from Salomon, the SMax 100 offers a precise, low-volume but customisable fit in an accessible medium flex for confident intermediates and lighter or less aggressive advanced skiers.